Crochet hook to give you a nice tight gauge for amigurumi. 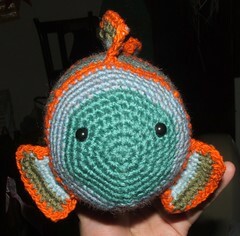 I used a 3mm hook, but I crochet loosely. 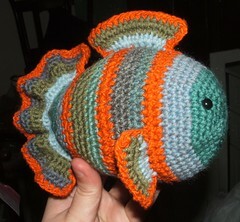 Fish is worked in rounds of single crochet (double crochet in UK terminology! ), all rounds start with a ch1 and end with a sl st to join, this is to make the stripes look neat. If you aren't as obsessive as me, you can work it in a continuous spiral instead, just make sure to place a stitch marker to mark the beginning of rounds. The '--'s denote where I changed colour for the orange stripes. Rnd 1: Make a magic ring, sc 6 into ring, and tighten. Row 3 and 4: sc. Fasten off.